There are lots of instructions for doing this on the internet, so I won’t bore you with the details. None of them, however, cover working around canine friends, but I think I managed to avoid any loss of whiskers or tail hair. I decided to start with something simple: a round rug. The joy of this is that I can just keep working round and round until I run out of t-shirts (or possibly patience). I have learned not to cut the strips too wide as it makes it very hard to work with (the white was a bit too thick for comfort). As you can see from the latest picture, it’s currently about 14 inches across and that has used up all the yarn that I made from three large t-shirts. As a truly scrappy project, I am just going to make use of all the colours that I have, so it may not be the most aesthetically pleasing creation, but it is becoming a lovely thick mat and should provide good insulation on a cold floor, plus it feels like a very positive use of fabric that would been of little use for anything else (I really have enough dusters and cleaning cloths for now). I have an increasing number of friends who keep sheep and, therefore, they have lots of fleeces around at this time of year. This means that, because of my interest in things woolly, I get plenty of offers of fleece. In general, I turn them down because my real loves are knitting and crochet (and a bit of felt-making on the side) and I really don’t want to have to go through all the rigmarole to get to yarn (or wool tops for the felt). However, when one of my Twitter friends said that she wanted to have a go at making felted fleece rugs from her collection of fleeces, I asked if I could join in (just in case I loved the activity and would have found a reason to accept all those fleecy offers). So, last Sunday, another friend and I trundled down to Carmarthenshire, and rolled up our sleeves, to get felting. The idea is to use a whole fleece and felt the underside of it (using wool from a different sheep) whilst keeping the top unfelted. You do this (according to the instructions we were following) by working on a mesh, so that what will be the top of the final rug hangs down through the gaps and doesn’t get involved in the felting process. You start my making lots of fluff from a tatty fleece, pulling it gently apart and separating the fibres, then you spread these out over the underside of the fleece. First in one direction, then in the other. After that, it’s simply a case of using soap and water to work the wool into felt. I say ‘simply’, but it’s actually really hard work to persuade raw (although washed) wool, in large quantities, to become felt. We made some progress with three of us working together, but we didn’t complete the rug. It turned out that the gaps in the mesh of the fence panel we were working on were a bit too big – not providing enough support to felt successfully without moving the fleece around periodically. The panel was a bit too bouncy as well, so a bit more support would have been helpful. Our instructions suggested using washing-up liquid as the soap, but it’s harsh on the hands after a whole day and I would use olive oil soap in future, as I do for other felting. There was no mention of covering the work with net (as I usually do when felting) to stop the fibres lifting up. It’s absence made the work much more difficult and I would employ a net cover next time. The process could have been speeded up by using a rolled bamboo mat as a sort of rolling pin to give extra friction a bit later in the process. A whole fleece was a rather ambitious first project – it would have been better to make some mats to begin with. I’m sure there’s going to be a next time! I might even remember to photograph the finished item second time round. … is that it lasts! Don’t get me wrong, I still think that it’s good to buy products that won’t need to be replaced soon, I just wish that the people who owned our house before us hadn’t invested in expensive, plain dusky pink carpets in all the bedrooms and the living room. We’ve been here 14 years now and the carpets are still going strong. This has saved us huge amounts of money because the only floor covering in the house that we have needed to replace in all that time has been the lino in the kitchen (we now have a floating bamboo floor that can be sanded down and resealed when it becomes worn) but I do dislike the carpets. I wish that they’d chosen something with flecks (so it wasn’t so obvious when they needed vacuuming) and something not so… pink. However, I simply cannot bring myself to replace something that isn’t worn out. I have considered re-carpeting the living room on a number of occasions, but I know that all I need to do is vacuum and maybe shampoo it and it will look as good as new (well, nearly) and so I don’t visit the local carpet shop or start researching environmentally friendly carpets. 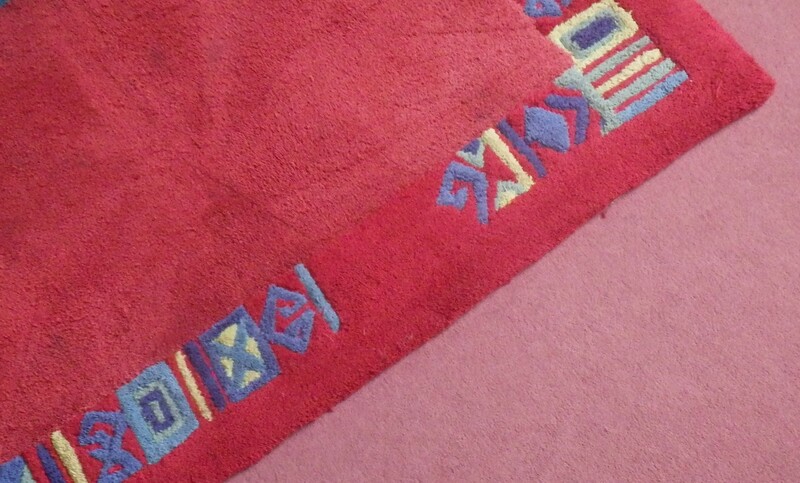 We do have a nice rug in front of the fire which covers up quite a bit of the pinkness, but it’s still there in the rest of the house and it’s NEVER going to wear out in the other rooms. Sometimes I wish I was a bit more frivolous. I guess that it could have been worse, though – they could have selected a vibrant paisley pattern!